UN Secretary General Ban Ki-moon appointed Hervé Ladsous, currently the Chief of Staff to the French Minister for Foreign Affairs Mr Alain Juppé. 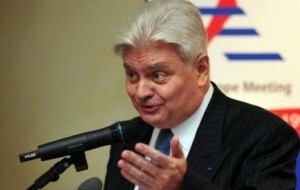 He succeeds Alain Le Roy, who departed the post on 23 August 2011. M. Ladsous’ appointment continues the tradition of appointing a French national to the top peacekeeping post. The top positions in the UN cabinet are appointed by the Secretary General but always go to one of the five veto-wielding permanent members. Valerie Amos of the United Kingdom is currently the top humanitarian official, American B. Lynn Pascoe heads the Department of Political Affairs, and China’s Sha Zukang is Under-Secretary-General for Economic and Social Affairs. The increasing number of peacekeeping missions approved by the Security Council in recent years — including Haiti, Western Sahara, Lebanon, Sudan, Kosovo – means Ladsous takes over operations that have expanded four-fold since the end of the Cold War. Between 110,000-120,000 personnel, including about 98,000 uniformed troops, serve in 15 current operations around the world. Overall peacekeeping costs this year were between US $7-8 billion.